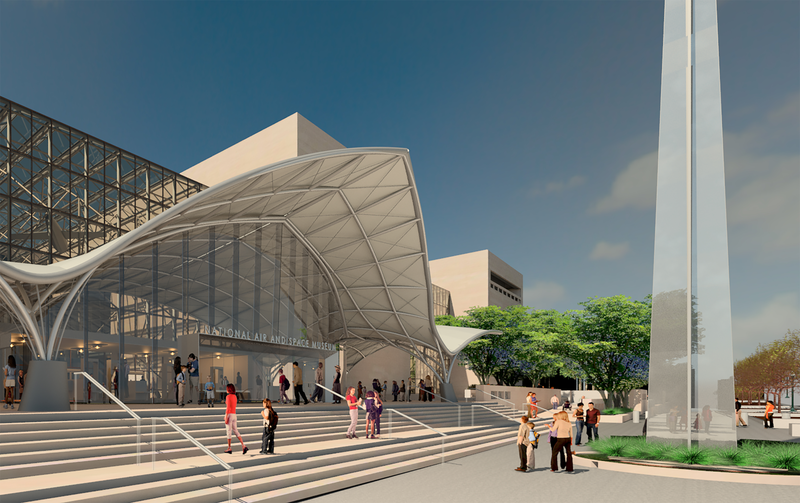 The Smithsonian has announced plans to revitalize the National Air and Space Museum and transform its exhibitions. The project, which will take approximately seven years, will be done on a phased sequencing schedule that will keep many exhibitions open during the construction process. The building will undergo complete refacing of the exterior cladding, replacement of outdated mechanical systems and other repairs and improvements. The visitor experience will also change when all of the museum’s 23 galleries and presentation spaces are updated or completely redone. Construction will begin on the west side of the museum, which houses nine exhibitions, some of which have not significantly changed since the building’s opening 41 years ago. To safeguard artifacts during construction, most will be moved to a new state-of-the-art collections storage facility currently under construction near the museum’s Steven F. Udvar-Hazy Center in Chantilly, Va. After the artifacts are returned to the museum on the National Mall when construction ends, the facility will be used to store other museum collection items not currently on display. The exhibition plan will use creative and dynamic techniques to engage visitors while they are at the museum and after they leave. Many exhibitions will be refreshed but retain current themes, and others will be completely replaced. The exhibitions throughout the museum will be grouped by theme to allow for easier way finding and a better visitor experience. When the new exhibitions begin to open in 2021, visitors will see favorite artifacts presented in new settings, such as the Apollo 11 command module Columbia, which will be housed in a custom-designed, climate-controlled case as the centerpiece of the “Destination Moon” exhibition. Recently captured 3-D digital photography of calculations and notes made by the crew inside Columbia will be shown alongside the artifact, revealing interior components of the module that would otherwise remain hidden to the public. Each of the exhibitions will incorporate presentation spaces that will allow experts and visitors to engage with the content through demonstrations and discussions, all shared through online webcasts. Instead of simply presenting information to visitors, the exhibitions will provide ways of engaging people through hands-on experiences. In “Exploring the Planets,” for example, visitors will tour the solar system and learn what it would be like to walk on another world through an immersive, interactive experience. To learn more about the project, visit airandspace.si.edu/reimagine. The Smithsonian has requested funds in its 2018 federal budget to begin the exterior and building infrastructure work. In subsequent years, additional amounts will be requested. The Smithsonian estimates the total cost of the building revitalization will be about $650 million. In addition, the museum will raise the $250 million it needs for new exhibitions through private sources. Artist rendering of Exploring the Planets exhibition. Artist rendering of the One World Connected exhibition. Artist rendering of Destination Moon exhibition. Artist rendering of the Nation of Speed exhibition.